from Beyträge zur Geschichte der Vögel. On the continent several important figures stood out. In the mid 18th century Jacob Theodor Klein [1685-1759], influenced by the thinking of Linnaeus, authored two important fundamental treatises that are represented in the Hill Collection. The first, his Historiae avium prodromos (1750), accepted Linnaeus's use of beak and foot as points of reference, but varied the Swedish botanist's scheme considerably. 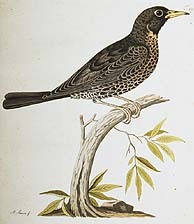 Klein's second work, Stemmata avium (1759), was a detailed study of the feet, heads, and tongues of birds. Representing another part of the world in the late 18th century, Joseph Franz Jacquin issued his Beyträge zur Geschichte der Vögel (1784). This work describes thirty-two birds of Central America, several of which were newly discovered species. Good colored plates accompany the text. The Hill Collection includes a copy of this interesting work. A brief mention of two other titles closes the discussion of the mid- to late-18th century. The first is Ornithologia borealis (1764), a description of a private collection of birds of Denmark, Iceland, and Northern Europe, by Morten Thrane Brunnich [1737-1827]. Brunnich is described by the Danish bibliographer Jean Anker as the founder of Danish faunistic zoology and was a highly praised systematist. The second title is the five-volume Ornithologia methodice digesta atque iconibus aeneis ad vivum illuminatis ornata by Saverio Manetti [1723-1784], issued in Florence from 1767 to 1776. This ornate work was illustrated with 600 hand-colored copper plates and contains text in Italian and Latin, using nomenclature mainly Brisson's nomenclature.